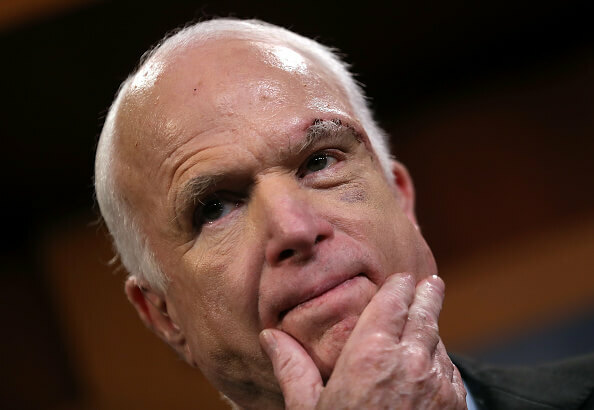 Senator John McCain’s recent announcement of surgery to remove a cancerous brain tumor and appearance on television with his scars still very visible while on the floor of the U.S. Senate, have renewed interest and concern about tumors, especially regarding brain cancer. Cancerous tumors develop when the natural life cycle of cells is disrupted in some way. Usually, our cells grow and divide to form new cells as the body needs them. When those cells grow old or become damaged, they die and new cells take their place. However, when cancer develops, old and damaged cells survive and new cells form when they are not needed. These extra cells divide without stopping and may form tumors. In the case of Senator McCain, he was diagnosed with glioblastoma, a particularly aggressive type of brain tumor. Approximately 80,000 cases of primary tumors are expected to be diagnosed this year. Of these tumors, almost 15 percent will be glioblastomas. While this type of brain cancer is not one of the most common cancers, its most aggressive form has an alarmingly low long-term survival rate. Currently, there are no tests to predict your individual risk for developing a malignant brain tumor. Symptoms may include headache, nausea, vomiting and drowsiness. Depending on the location of the tumor, there may be additional symptoms like weakness on one side of the body, visual changes, memory and/or speech difficulties. Notwithstanding, research has shown that nutrition may play a key role in preventing tumor development and growth. In fact, estimates are that up to 30 percent of cancers may be linked to poor dietary habits. Nutrition may also reduce the side effects of brain cancer treatment, as well as potentially produce better treatment outcomes. Magnesium. There is some evidence that magnesium may reduce the overall risk of cancer. In one study, researchers found that the group with the highest magnesium intake seemed to have the lowest overall cancer risk, while the lowest magnesium level group carried a higher risk. Selenium. Selenium may be protective against cancer, and a deficiency in this important mineral may be a risk factor for several types of cancer. If you have been diagnosed with brain cancer, talk with your oncologist about this mineral before treatment. Calcium. Adequate calcium may decrease your risk for colorectal cancer. Recent studies confirm that high calcium intake is associated with a lower risk of colorectal cancer among both men and women. Maintaining the correct levels of calcium in your system may also reduce your risk for breast cancer. Zinc. People with increased dietary zinc intake may have a lower risk of lung cancer, a study suggested, noting the protective benefits of this mineral. Copper. People with increased dietary copper intake may have a lower risk of lung cancer, a study suggested, noting the protective benefits of this mineral. Iron. Increased iron intake may also help protect against lung cancer. However, excess iron intake can cause other health problems. Sulfur. Sulfur is a key part of antioxidants, which protect your body against free radical damage, which may contribute to cancer development. Vitamin E. Vitamin E is another antioxidant of interest in brain cancer. According to one study, it can enhance chemotherapy treatment for drug resistant glioblastoma cells, increasing effectiveness. Another study from Tufts University showed taking vitamin E before treatment may make radiation therapy more effective. Vitamin D. Studies conducted at the UC San Diego School of Medicine showed that higher levels of Vitamin D are associated with a reduced risk of cancer. And if you’re pregnant, make sure you are also getting enough vitamin D. Some studies show that a vitamin D deficiency before birth could predispose a child to brain tumor formation later in life, as well as have long-term effects on brain development in general. Antioxidants. According to the American Cancer Society, a diet high in vegetables and fruits has been linked to the reduction of certain cancers. Vegetables and fruits like broccoli, beans, spinach, apples, oranges and pineapples are rich in antioxidants, which work to prevent cancer and a host of other diseases. Limit Simple Carbohydrates. Foods that tend to be “white” are also foods that are usually highly processed. This processing renders them very low in nutrients and very high in sugars. Some of the most common examples of “white foods” are white bread and white rice. Try switching to grain-rich breads and brown rice. These will help you get fiber, selenium and other vitamins important in preventing and treating brain cancer. Increase Plant-based Foods. These foods appear to stimulate your immune system and help your body fight cancer. Some of these foods include onions, garlic, carrots, sweet potatoes, tea, coffee, citrus fruits, cruciferous vegetables (such as broccoli and kale), berries, beans and whole grains. Use Supplements Wisely. It’s always better to get your nutrients through natural foods rather than taking supplements. Getting them in their more natural forms will help your body better absorb and process these nutrients. But if your doctor recommends taking supplements, make sure you get them from a reliable source. When it comes to brain tumors and other types of cancers, be proactive and remember that reducing some of the risk factors for them is in your control. Be sure to make healthy choices regarding your diet and exercise regimen. Avoid carcinogens such as cigarette smoke and those found in many personal care items. Get your vitamin and mineral levels tested to ensure you are getting enough of these cancer-fighting nutrients in your diet.